For the city in Kyrgyzstan, see Jalal-Abad. For the city in Azerbaijan, see Jalilabad. For others, see Jalilabad (disambiguation) and Jalalabad (disambiguation). 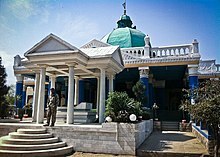 Jalālābād /dʒəˈlæləˌbæd/, or Dzalalabad, (Pashto: جلال آباد‎) is a city in eastern Afghanistan. It is the capital of Nangarhar Province. Jalalabad is located at the junction of the Kabul River and the Kunar River. It is linked by an approximately 150-kilometre (95 mi) highway with Kabul to the west, and a 130-kilometre (80 mi) highway with the Pakistani city of Peshawar to the east. Jalalabad has a population of 356,274 (2015 estimate), making it one of the five largest cities of Afghanistan. From top left to right: A panoramic view of a section of Jalalabad; Jalalabad Bridge; Jalalabad Cricket Stadium; Pashtunistan Square; Mosque in Jalalabad; Governor's House in Jalalabad; Building on a main road. Jalalabad is a leading center of social and trade activity because of its proximity with the Torkham border crossing, 65 km (40 mi) away. Major industries include papermaking, as well as agricultural products including oranges, rice, and sugarcane. It has six districts and a total land area of 12,796 hectares (31,620 acres). The total number of dwellings in this city is 39,586. Faxian visited and worshiped the sacred Buddhist sites such as of The Shadow of the Buddha in Nagarhara (modern Jalalabad). In 630 AD Xuan Zang, the famous Chinese Buddhist monk, visited Jalalabad, which he referred to as Adinapur, and a number of other locations nearby. The city was a major center of Gandhara's Greco-Buddhist culture in the past until it was conquered by Ghaznavids in the 11th century. However, not everyone converted to Islam at that period as some still refused to accept it. In Hudud-al-Alam, written in 982 CE, there is reference to a village near Jalalabad where the local king used to have many Hindu, Muslim and Afghan wives. The region became part of the Ghaznavid Empire in the 10th century. Sabuktigin annexed the land all the way west of the Neelum River in Kashmir. "The Afghans and Khiljies who resided among the mountains having taken the oath of allegiance to Sabuktigin, many of them were enlisted in his army, after which he returned in triumph to Ghazni." The Ghurids succeeded the Ghaznavids and expanded the Islamic empire further into Hindustan. The region around Jalalabad later became part of the Khalji territory, followed by that of the Timurids. It is said that the original name of Jalalabad was Adinapur. It was renamed as Jalalabad in the last decade of the sixteenth century, in honour of Jalala, the son of Pir Roshan. The modern city gained prominence during the reign of Babur, founder of the Mughal Empire. Babur had chosen the site for this city which was built by his grandson Jalal-uddin Mohammad Akbar in 1560. It remained part of the Mughal Empire until around 1738 when Nader Shah and his Afsharid forces from Khorasan began defeating the Mughals. Nader Shah's forces were accompanied by the young Ahmad Shah Durrani and his 4,000-strong Afghan army from southern Afghanistan. In 1747, he founded the Durrani Empire (Afghan Empire) after re-conquering the area. The Afghan army has long used the city while going back and forth during their military campaigns into the Indian subcontinent. The British-Indian forces invaded Jalalabad in 1838, during the First Anglo-Afghan War. In the 1842 Battle of Jellalabad, Akbar Khan besieged the British troops on their way to Jalalabad. In 1878, during the Second Anglo-Afghan War, the British again invaded and set up camps in Jalalabad but withdrew two years later. Jalalabad is considered one of the most important cities of the Pashtun culture. Seraj-ul-Emarat, the residence of Amir Habibullah and King Amanullah was destroyed in 1929 when Habibullah Kalakani rose to power; the other sanctuaries however, retain vestiges of the past. The mausoleum of both rulers is enclosed by a garden facing Seraj-ul-Emart. The Sulemankhils, a Pashtun family famous for their scientific research, is from Jalalabad. Other celebrated Pashtun families originate from the villages near Jalalabad too. From 1978 to early 1990s, the city served as a strategic location for the Soviet-backed Democratic Republic of Afghanistan. In spring 1989, two Mujahideen rebel factions backed by Pakistan and the U.S. assaulted the city during the Battle of Jalalabad. However government forces managed to drive them out within two months, which was a major setback to the resistance fighters and the ISI. After the resignation of President Najibullah, Jalalabad quickly fell to mujahideen rebels of Yunus Khalis on April 19, 1992. On September 12, 1996, the Taliban took control of the city until they were toppled by the US-backed Afghan forces in late 2001. Al-Qaeda had been building terrorist training camps in Jalalabad. The city returned to Afghan government control under Hamid Karzai. The economy of Jalalabad gradually increased in the last decade. Many of the city's population began joining the Afghan National Security Forces. Construction has also risen. The Jalalabad Airport has long served as a military base for the NATO forces. In 2011, the U.S. Embassy in Kabul announced that it plans to establish a consulate in Jalalabad. Occasional suicide attacks by anti-Afghanistan forces often take place. These forces include the Taliban, Haqqani Network, al-Qaeda, and the new ISIS (Daesh) group. The United States has promised to totally eliminate these groups before withdrawing from Afghanistan. The city population is estimated to be 356,274 in year 2015. Nearly all residents of Jalalabad are Muslim, followers of Sunni Islam. The city is home to one of Afghanistan's few Hindu temples, the Darga Hindu Temple founded in c. 1084 AD. Jalalabad is the regional hub in eastern Afghanistan, close to the border with Pakistan. Agriculture is the predominant land use at 44%, higher density of dwellings is found in Districts 1-5 and vacant plots are largely clustered in District 6. Districts 1-6 all have a grid network of roads. Jalalabad's climate is hot desert (Köppen: BWh). The city's climate has close resemblance to that of Arizona in the United States. It receives six to eight inches (152 to 203 mm) of rainfall per annum which are limited to winter and the months of spring. Frosts are not common, and during the summer, the temperature can reach a maximum of 120 °F (49 °C). The north and southwestern parts of the city which has lower elevation are welcoming places to winds from the north and west cooling the parts in summer months. Jalalabad has the highest relative humidity in summer compared to other Afghan cities. However the moderate temperatures of winter has led to various people down the history establishing their settlements in the city. Jalalabad is home to a large number of fruits. Various types of citrus fruits like orange, tangerine, grapefruit, lemon, lime grow in gardens as well as in orchards. The orange trees yield a crop only once in three years. The narindj variety of orange is the most common one which has yellow skin and its taste is a combination of orange and grapefruit. The grapefruits grown here have a diameter of eight or nine inches. Per year 1800 tonnes of pomegranates, 334 tones of grapes, and 7750 tones of mulberries are produced in Jalalabad. The fruits are either sold in local markets or transported to Kabul markets from where they are exported. The second most common crop is local vatani variety of sugarcane. It contains 15% sugar by weight. The Jalalabad Airport was built for dual-use, civilian and military. It is designed to serve the population of Nangarhar Province and neighboring province for domestic flights. The airport is currently used by NATO-led forces, including the Afghan Air Force, and houses large number of ISAF forces. The airport is also used as one of the launching and monitoring spots of drone attacks in Pakistan. There are proposals for the establishment of Afghanistan's rail network linking Jalalabad with Pakistan Railways, allowing for increased trade of goods, people and commerce between the two countries. Jalalabad is connected by main roads with the Afghan capital of Kabul, the city of Peshawar in Khyber Pakhtunkhwa, Pakistan, and several nearby Afghan cities and towns. All trade between Afghanistan and Pakistan passes through this city. The highway between Jalalabad and Kabul was resurfaced in 2006, reducing the transit time between these two important cities. This highway is considered to be one of the most dangerous in the world because of the large number of accidents. An improvement in the road networks between Jalalabad and Peshawar has also been proposed,[by whom?] with the intention of widening the existing road and improving security to attract more tourists and allow for safer passage of goods between to the two countries. Jalalabad is considered one of the most beautiful cities of Afghanistan. It has plenty of greenery and water. On the southeastern fringe of Jalalabad, a modern suburb called Ghazi Amanullah Town is under construction. Named after King Amanullah Khan, it is said to be the first, the biggest and the most modern township in the history of Afghanistan. Jalalabad is considered the capital of Afghan cricket, with many of the national players coming from the surrounding areas. Construction has begun near the city on one of Afghanistan's cricket stadiums. It is hoped that this ground will serve the domestic competition and attract international teams. Jalalabad Airport (IATA: JAA, ICAO: OAJL) is located 5 kilometres (3 mi) southeast of Jalalabad city in Afghanistan. This airport is currently being used only for military purposes and sometimes the United Nations' aircraft use this airport. It is occupied and maintained by the United States Armed Forces. They operate out of Forward Operating Base Fenty, which is adjacent to Jalalabad Airport. The Afghan Air Force (AAF) and members of the International Security Assistance Force also use the airport. Hamidullah Qaderi, Minister of Transport and Civil Aviation of Afghanistan, announced in April 2009 the construction of a new civilian airport in the Gambiri area northwest of Jalalabad. The new airport will be constructed with financial assistance from the United States. India and Pakistan operate their consulate here for trade, military and political links. Jalalabad district has three big hospitals: Fatumatu Zahra, Medical Hospital of Nangarhar, and the General Hospital of Public Health. The General Hospital of Public Health is one of the largest in the country. As of July 24, 2004[update], polio (NSL3) has been identified and reported in the Jalalabad district area. This specific case has been linked to others reported in the past due to the highly transient and mobile population. Nangarhar University (Pashto: د ننګرهار پوهنتون) is a government-funded higher learning institution in Jalalabad, Afghanistan. It is the second largest university in Afghanistan. It has approximately 25 faculty and 3,500 students. Nangarhar University was established in 1962 as a medical college. It was later merged with other local colleges to become a full-fledged university. It now houses faculties in agriculture, engineering, education, medicine, theology, pedagogy, political science and veterinary medicine. Nangarhar consists of many faculties including engineering, political science, economics, teachers' training, veterinary, and computer science. Nangarhar Medical Faculty (NMF) is the second largest medical school in Afghanistan. They also take part in an e-learning program organized by Afghans Next Generation e-Learning. The nearest village within walking distance of Jalalabad is Ghouchak. The province is represented in domestic cricket competitions by the Nangarhar province cricket team. National team member Hamid Hasan was born in the province and he currently represents Afghanistan in international cricket. The Ghazi Amanullah International Cricket Stadium is the first international standard cricket stadium in Afghanistan. It is located in the Ghazi Amanullah Town, a modern suburb on the southeastern fringe of Jalalabad in Nangarhar Province. Construction on the stadium began in March 2010 when the foundation stone was laid by Minister of Finance and president of the Afghanistan Cricket Board, Omar Zakhilwal. The project, which was developed on 30 acres of land donated by the developer constructing the Ghazi Amanullah Town, cost up the first phase of construction $1.8 million. The first phase, which took one year to complete, included the completion of the stadium itself. The remainder of the phases will see the construction of a pavilion, accommodation for players and administrative buildings. The stadium, which has a capacity of 14,000, was completed before the national team and under-19 team left for Canada and the Under-19 Cricket World Cup Qualifier in Ireland respectively. The two sides inaugurated the stadium in a Twenty20 match. It is hoped that the stadium will be able to attract international teams to play Afghanistan, who currently have One Day International status until at least 2013. ^ "MRRD" (PDF). Archived from the original (PDF) on 2010-03-04. Retrieved 2013-03-13. ^ "Jalālābād". Encyclopædia Britannica. Retrieved 2011-08-15. ^ Kuwayama, Shoshin. "The Hephthalites in Tokharistan and Northwest India". In Liu, Xinru. India and Central Asia. Permanent Black. p. 240. ISBN 8178243474. ^ Vogelsang, Willem (2002). The Afghans. Wiley-Blackwell. p. 18. ISBN 978-0-631-19841-3. ^ Adamec, Ludwig W. (2011). Historical Dictionaries of Asia, Oceania, and the Middle East : Historical Dictionary of Afghanistan. Scarecrow Press. p. 264. ISBN 9780810878150. ^ "Jalālābād | Afghanistan". Encyclopedia Britannica. Retrieved 2019-02-18. ^ Rupert, James (8 July 1989). "AFGHANISTAN REBELS LOSE KEY BATTLE". Retrieved 28 January 2018 – via www.WashingtonPost.com. ^ "Afghan rebels capture Jalalabad". UPI.com. Retrieved 28 January 2018. ^ Naadem, Bashir Ahmad (February 24, 2011). "US to open consulates in more provinces". Pajhwok Afghan News. Retrieved 2011-08-15. ^ "Jalal Abad Climate Normals 1964-1983". National Oceanic and Atmospheric Administration. Retrieved December 25, 2012. ^ "Work on Jalalabad railways station launched". Pajhwok Afghan News. 3 January 2013. Retrieved 2013-01-04. ^ Filkins, Dexter (7 February 2010). "A Highway in Afghanistan Presents Scenes of Beauty and Death". Retrieved 28 January 2018 – via NYTimes.com. ^ "San Diego Jalalabad Sister Cities". San Diego Jalalabad Sister Cities. Retrieved 28 January 2018. Aloys Arthur Michel. The Kabul, Kunduz, and Helmand Valleys and the National Economy of Afghanistan: A Study of Regional Resources and the Comparative Advantages of Development. National Academies. Grove Encyclopedia of Islamic Art & Architecture. Oxford University Press. 2009. Wikimedia Commons has media related to Jalalabad. Wikisource has the text of the 1911 Encyclopædia Britannica article Jalalabad. "Jalalabad". Islamic Cultural Heritage Database. Istanbul: Organization of Islamic Cooperation, Research Centre for Islamic History, Art and Culture. Archived from the original on 2013-06-15.